Elizabeth, in the midst of the wealth and the prestige of royalty, was drawn to a life of prayer and service to the poor. Her spiritual disciplines: fasting, waking in the middle of night for prayer, generosity of time and treasure, and a love for the sick and needy caused some tension in her marriage, especially with her in-laws and other nobility. Once, while Elizabeth was out tending the needy, her husband passed her on the road and stopped to see what she had concealed in her cloak. When Elizabeth opened her cloak, roses fell out instead of the bread she was hiding. Elizabeth is therefore known as the patron saint of bakers as well as of nursing homes, brides, and beggars. She continued to devote herself to caring for the sick, the aged, and the poor at a hospice in Marburg after her husband's death. Elizabeth died on November 17, 1231 at Marburg prior to her twenty-fourth birthday. Soon after her death, miracles were reported at her tomb. Pope Gregory IX canonized Elizabeth in 1235. 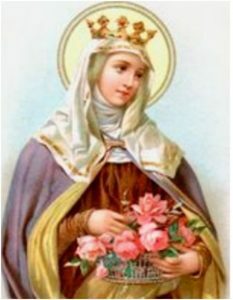 Her feast day is celebrated on November 17.